While wood has been used for centuries as a primary flooring material, it nonetheless has its drawbacks. 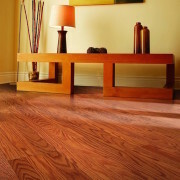 Primarily, wood is susceptible to many different types of wear and tear. Wood can be scratched or damaged by water and is not always the best choice if you have pets or children. Fortunately, new innovations in floor coverings have led to alternatives. One great alternative to traditional wood flooring is porcelain tile that looks like wood. Let’s examine what it is and why it may be better than wood floors. 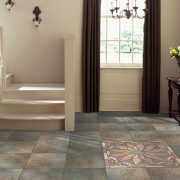 Due to its durability, porcelain tile is regularly hailed as a great flooring option. Porcelain is impervious to water, cannot be scratched, and resists fading. 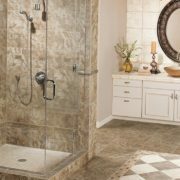 Porcelain tile is a favorite surface for bathrooms, kitchens, and entryways, because of its ability to withstand water. Accordingly, contractors and designers often dissuade homeowners from using wood in these types of rooms. For more details about porcelain tiles, check out our article here. The biggest argument against porcelain when considering wood is typically the style. Porcelain is fairly cool and can often be bland. The colors tend to be solid, and patterns are either very intricate for accent work or meant for larger spaces. However, new techniques now allow porcelain tile to mimic wood grain. 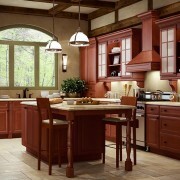 The wood grain style is rustic-looking for a more Arts & Crafts or natural aesthetic. Sturdy and Long-Lasting: Porcelain isn’t impacted by water. It is also resistant to scratches, dents, and fading. Anti-Microbial: Perfect for families with children or pets, especially in rooms where there might be a concern of bacteria. Warmth for all Rooms: Now you can have the look of wood in your bathroom, kitchen or sunroom without worrying about water damage or fading. 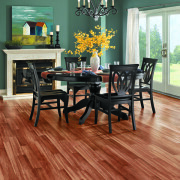 For more information about porcelain tile that looks like wood, contact Go Mobile Flooring today. We are happy to bring our mobile showroom to your home. We offer service to the Tampa Bay and surrounding areas including New Tampa, South Tampa, St Petersburg, Clearwater, Brandon, Wesley Chapel, Land O’ Lakes, and more! Greener Flooring Decisions: Which Companies Have Policies & Practices that are Environmentally Friendly? Cabinets and Floors: Dynamic Partners!